Do you remember? In 1976, the French government introduced Bison Futé – its traffic estimation and prediction system – in order to make life easier for holidaymakers; On April 1, Steve Jobs and his friends founded Apple. And in August, at the Nürburgring motorsports complex, Niki Lauda’s Ferrari swerved off the track and burst into flames. He returned to racing only a few weeks later! Not a single drop of rain fell during that summer: the reservoirs were all empty, mineral water was being rationed and the heat wave was having a devastating effect on farming. While the French were nodding off in the summer heat, Albert Spaggiari and his stooges took advantage of the situation to carry out what would later become the heist of the century on the vault of Nice’s Société Générale bank. But that's not all. France introduced its first National Lottery; Concorde made its first Air France-operated commercial flight to Rio de Janeiro; The Clash, U2 and French rock group Téléphone all burst onto the music scene; Taxi Driver won the Palme d'Or at the 1976 Cannes Film Festival; Peugeot snapped up Citroën and a group of crazy enthusiasts founded the first major classic car show: Rétromobile. That was the year that Renault released its 7 CV du bonheur – its R14; Mercedes unveiled its new W123 saloon; BMW rolled out its E24 BMW 6 Series passenger coupé; Citroën released an estate version of its CX; Alfa Romeo released its elegant “Sud Sprint” coupé; Alpine put a PRV V6 engine in its A310 and Volkswagen unleashed a bomb onto the auto market: the Golf GTI. All these cars are now 40 years old and French magazine “Youngtimers” wanted to celebrate this anniversary by bringing them all together on a special podium. Sud Sprint Unveiled in autumn 1971, Alfa Romeo’s Alfasud saloon was a major revolution. Instead of being rear-driven, it was a front wheel drive car, incorporating a flat four-cylinder engine instead of the more traditional double overhead camshaft. This did not hamper its success and a coupé version was released five years later (1976): the Sprint, which is on show here. It began its career with a 1286 cm³, 76 HP Boxer engine (a Weber twin-body carburettor). In 1978, it was given a new 1.5 L 85 hp (a single carburettor), while the 1.3 L model was expanded to 1351 cm³ and 79 hp. The Sprint was given a facelift in 1983, before being retired in 1986 with around 120,000 models produced. On 11 March 1971, the new Alpine was unveiled at the Geneva Motor Show at Renault's stand. As far as the vehicle's mechanics were concerned, the staff initially incorporated an optimised version of a four-cylinder engine (1605 m³, 125 hp DIN) from an R16 TS into it, as they did not have a V6 available. It wasn't a bad engine, but it wasn't quite powerful enough to go head-to-head against the thoroughbreds of Stuttgart. Then in July 1976, it was out with the four-cylinder and in with the eagerly anticipated V6. This engine, taken from the R30 TS, cranked the car's power up from 125 to 150 hp. 9269 A310 V6s were manufactured between 1976 and 1984. 7286 of these were 2700 VA models, 6 were Group 4 2700 VA models, 1950 were GT Pack 2700 VAA models and 27 were Boulogne 2700 VAA models. Series The opulent successor to the slender CS/CSI, the 6 Series, based on the E12 5 Series (and then the E28), was a very popular symbol of success among the wealthy. There were two versions of the BMW 6 Series: the carburetted 630 CS (185 hp) and the injection 633 CSi (200 hp), both fitted with four-speed gearboxes. These were followed by the 635 CSi (218 hp), and then the “M” version powered by the 286 hp “M” engine. The car had an exceptionally long career: a total of 86,216 units (in multiple variants) were produced up until July 1989. Finding a worthy successor to the legendary DS proved incredibly difficult. A challenge that the CX timidly took up when it was unveiled to the public in August 1974 with its hydro pneumatic self-levelling suspension system! Sales quickly took off – 100,000 were sold in 1975. The range was expanded to include an estate version in September 1975 (released in 1976). It became the darling of second-hand goods dealers and ambulance drivers. The model on show is one of the very first – a 2000 Super estate from March 1976. An incredibly durable vehicle, the immortal Mercedes W123 is gradually being seen less as a second-hand workhorse and more as a classic car. First unveiled in January 1976, the very safety-conscious W123 was one of the very first mass-produced cars to feature ABS and a driver-side airbag (optional). Add into the mix the highest possible level of manufacturing quality and you get the most sturdy saloon car in history. Every possible version was made: petrol, diesel, 55 to 185 hp, a saloon version, an estate version and a coupé version. 2,696,915 (all versions together) were produced between 1976 and 1986. With its reputation as a completely indestructible car, the Mercedes W123 has to be the most popular car of its generation on the planet. Dowdy in the extreme, the “pear", as it was called, doesn't have the makings of a classic car. At least, not on paper. But it is not quite what you might call damaged fruit. Released in May 1976, the “7 CV du bonheur” as it was called only had a 1218 cm³ four-cylinder engine (57 hp) and was only available in two rather sparse trims (L and TL). The transversely mounted engine that was jointly lubricated alongside the Peugeot-designed gearbox put off the state salesmen who were not convinced that such engine architecture was durable – so much so that they frightened customers away. Renault had another failure in 1978 with its legendary advertising campaign that compared the car (and indirectly its owner) to a pear – because of its “voluptuous curves". And it had to deal with problems with its water tightness and its finish, as well as premature corrosion. Consequently, only 999,250 Renault 14s were ever produced between 1976 and 1983 – less than half the number of R12s produced. 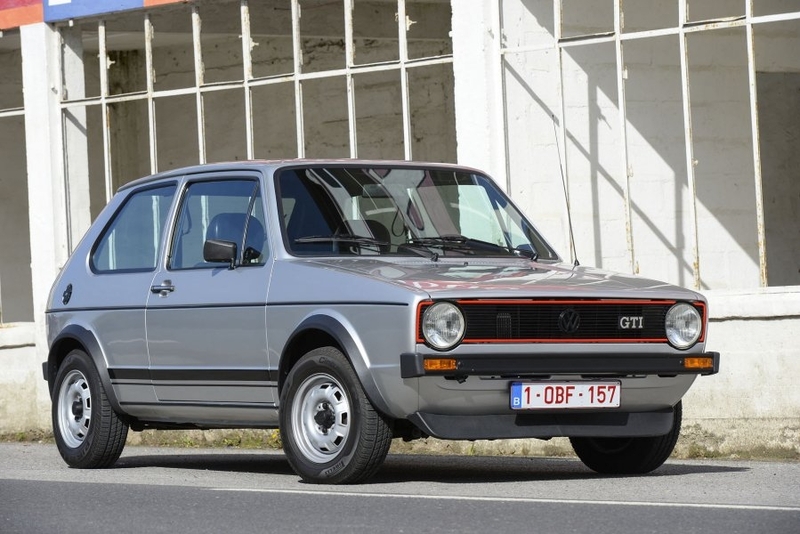 Released in Germany in September 1975, the GTI 1.6 had a 110 hp engine and a four-speed gearbox. Available in France from autumn 1976 onwards, it was indisputably top of the "hot hatch" category for several years, rivalled only by the less powerful Renault 5 Alpine (93 hp). 470,826 of them were produced between 1976 and 1984, proving so successful that a whole new segment was created named after it: GTIs – cars which flooded the market in the 1980s. It also gave birth to a whole line of vehicles, with the seventh generation being released at the end of 2013.